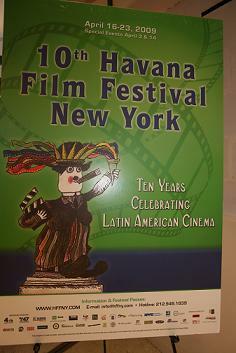 The highlight of opening night at Havana Film Festival New York was the presentation of Freddy Vargas’s 12 minute film, “Hispaniola,” which won HBO’s Best Short Film Competition Award in 2007 at the New York Latino Film Festival. Vargas, born in the Dominican Republic and currently living in New York, returned to Santo Domingo to shoot “Hispaniola,” a docudrama that ambitiously–and successfully–tackles a number of themes relevant to Dominican society today, including racism, relations between Haitians and Dominicans, immigration, and economic challenges in the developing world. The film depicts two families from drastically different economic, social, and cultural backgrounds. There’s the well-to-do family of a gruff Dominican politician–all light-skinned–who live in a beautiful home, albeit one that’s enclosed behind a gate. Right across the street is a family of Haitian immigrants, who have come to Santo Domingo to work. While they construct the home of a verbally abusive Dominican, they cook and sleep on the worksite and worry constantly about being deported by immigration, as they’re in Santo Domingo without papers. The families, of course, would never cross paths were it not for the young sons of each group. While playing with the family’s maid in his back yard, the baseball of the politician’s son bounces outside the gate and across the street, into the hands of the excited young son of the workers. Remarkably, the politician’s son hasn’t yet been indoctrinated by his father’s ideology, and he invites the Haitian boy to play. When the father comes home, though, he explodes. What is a black boy–a Haitian!–doing in his pool, in his yard, in his home? In the final scene, immigration swarm onto the worksite, picking up the Haitian family and carrying them away. Implied is the possibility that the politician called to report them. It’s a tense, explosive 12 minutes, and one that accurately portrays painful truths about current social problems on the island. Yet as interesting as the film is, so too is Vargas’s story of making it. For someone who doesn’t know much about the Dominican Republic, the issues depicted in “Hispaniola” might not seem to warrant so much opposition from so many different sources. But race in Hispaniola, the name of the island shared by Haiti and the Dominican Republic, is anything but simple. Vargas’s goal in making “Hispaniola” was to raise consciousness about identity and race relations in the Dominican Republic, and to advocate social change by inviting conversation about these issues. You can watch the full version of “Hispaniola” here.